Two dancers who want to share their passion for Fusion Dancing: Adrian and Marijn. 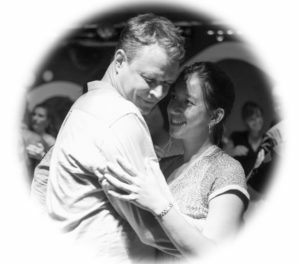 Marijn started with Ballroom and Latin dancing over twenty years ago. Over the years she has added Argentine Tango, Lindyhop, Blues and West Coast Swing to her dance vocabulary. She considers Fusion dancing as a universal language based on improvised leading and following. Adrian started with Argentine Tango dancing over twenty years ago. Over the years he has added Modern dance, Zouk, West Coast Swing and Blues to his dance vocabulary. He likes the challenge of combining elements from these different dances into each other. Together they love to explore the freedom of Fusion dancing.